Members of the B4BC team helped "shred" the love 2 weekends ago at Royal Gorge and Sugar Bowl. Visit the B4BC blog at b4bc.org/b4bc-shred-the-love-sugar-bowl to read more and to view full results from Sunday’s race. 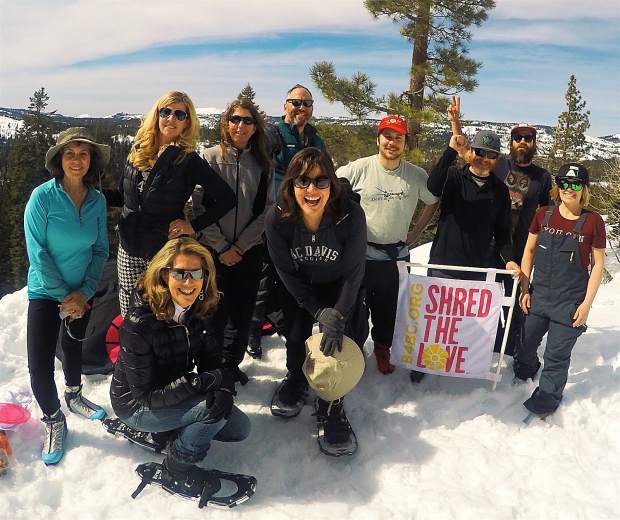 TRUCKEE, Calif. — Boarding for Breast Cancer (B4BC) earlier this month made its return to North Tahoe for another stop of the Shred the Love series for a few days of yoga, skiing, snowboarding and plenty of good times. The love could be felt all weekend, and we are so thankful for everyone who came out to support. This year marks the 11th year that B4BC has been shredding the love at Sugar Bowl, and every year is a rewarding experience. On Friday night, March 10, we kicked off with a heated glowing yoga session at Yoga Studio Tahoe. Decked out in glow sticks, the only light guiding us through our down dogs and push-ups was a blue LED light — rad. After sweating out all of the toxins in our body, we moved over to Dark Horse Coffee for live music by Angele and Jazz Cider. We enjoyed hot coffee and tea while admiring the amazing art supplied by Trevor Kekke, with 10 percent of all sales benefiting B4BC. The shop was consumed with nothing but good vibes and smiles, and it was the perfect way for us to ease into the weekend. On Saturday afternoon, March 11, we made our way to Royal Gorge. About 15 of us gathered for B4BC’s first ever cross-country adventure. We had the full range of abilities at this one — from some who had never been cross-country skiing, to those who had been doing it for 10-plus years. There were a few falls along the way, but tons of giggles and smiles all day. We skied out to Lyle’s Lookout to overlook Devil’s Peak and Palisade Creek Basin while we enjoyed avocado sandwiches, veggies, fruits and some oh-so-delicious Kind Bars. There’s nothing quite like being lost in the woods with a group of people coming together for a cause and taking in all of the beauty around. Once we finished skiing, we had a nice ease out of the day with a calming yoga session, again led by the amazing Yoga Studio Tahoe. Sunday morning, March 12, we got ready for our big day at Sugar Bowl. Over 60 people were lined up to register for our banked slalom. We had competitors of all ages — including a couple of parent-child combos (taking the competition to the next level). Inside near registration, we had a silent auction running through the day. We had a pair of Sarah Burke’s last pair of skis, Armada skis, a Nixon package, Indika bell, Barrett Christy and Tina Basich’s breast molds, iconic snowboard images, and more. We also had a full vendor village with support from Arbor Boardhouse, Clif, Wend Wax, Giro and Atomic (thank you!). Our booth was in full effect with breast self-exam lessons, bra pong, raffle tickets and tons of goodies. Throughout the afternoon, the vendor village enjoyed live music performed by Actors Killed Lincoln. To wrap up the day, everyone gathered for a raffle followed by banked slalom awards. We’re so stoked on the turnout and support that we received throughout the day. Throughout the weekend, we raised over $8,000 with proceeds benefiting the local community as well as our traveling education booth and survivorship programs. Thank you to our sponsors and volunteers for helping make this happen, and a big thank you to Sugar Bowl for hosting this event another year. This article was provided by the team at Boarding For Breast Cancer. Founded in 1996, the nonprofit empowers young people to make positive choices that promote lifelong wellness through outreach, prevention, sustainability and support programs. Visit b4bc.org to learn more.